The Fellowship was fortunate enough to obtain a copy of ICE #4 from 12-Gauge Comics. The story is by Doug Wagner with art by Jose Holder. The art for the Co-Feature and cover is by Brian Stelfreeze. Cole Matai has resigned from ICE (Immigration and Customs Enforcement) and has illegally entered Mexico to get the man responsible for the death of Ezra, his teammate and brother in arms. Does he want to bring Luis Morales to justice, or does he want him dead? And when the rest of the unit follows, will they be killed as well? The Co-feature finishes the story of why Cole never uses a bladed weapon (which comes into play in the main story). This is a great ending to a wonderfully written mini-series. How will Cole respond to the death of his longtime buddy and teammate? I won’t spoil it here, but it’s handled well. The other thing I enjoyed was the loyalty factor within the team.That's something that is sometimes overlooked in a team book. If you are familiar with Brian Stelfreeze’s work, you won’t be disappointed with what you see here. I like Jose Holder’s style and want to see more of his artwork. 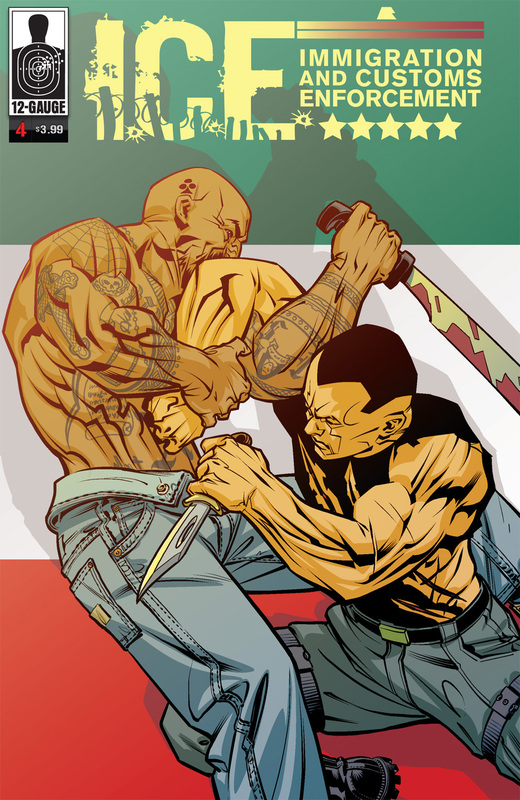 ICE #4 is in comic book stores now or available at www.12gaugecomics.com.